Making sure your automatic garage door lasts for as long as it can without suffering from non-stop malfunctions along the way is easily achievable with our company's maintenance service. The regular appointments we provide will see to it that everything from your springs to your opener is fully functional and in great working condition. Your door system consists of a wide range of different components, ranging in sizes as they do in purpose. We'll make sure everything from the tiniest bolt to the largest fastener is properly tightened and that the hardware parts they keep in place are perfectly aligned so that the door will have no trouble opening and closing smoothly. Of course, your door may be in great shape but it will be useless if these crucial components aren't able to support and counterbalance its weight the way they're supposed to. Garage door spring adjustment is a major part of our maintenance service, as it helps to alleviate some of the stress these units have to deal with, and it also ensures that the door doesn't become unbalanced. To make sure your door stays safe for you to use, we will check the parts that ensure that your automatic opener doesn't close the door while you or your family members are under it. These photo-electric eyes must be positioned correctly, and if they become misaligned they will fail to recognize an obstacle in the door's path. We'll realign them if necessary, and even replace them completely if we discover that they've become damaged somehow. If you want to get the most out of your system and ensure that it can continue working reliably for as long as possible, our team will be happy to help. 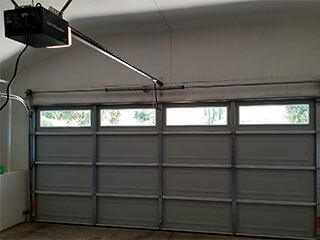 Contact Garage Door Repair New Rochelle today and let our technicians make sure that everything is in great condition.